The Buteyko Method of breathing retraining can help relieve your snoring without the need for anti-snoring devices or surgery. Many of our clients achieve improvement in their snoring and reduction in sleep apnoea episodes within the first few days of the programme. 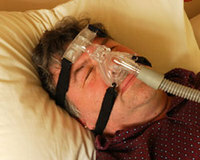 With functional breathing restored, snoring and sleep apnoeas can reduce and normal sleep patterns return. No one who breathes correctly should require an oral device, mouthpiece or CPAP machine to enjoy restful, snore-free sleep. You can read an article in the New Zealand Herald by John Roughan, As easy as drawing breath, about a tip he learned on the Buteyko course he did in 2006 has helped control his sleep apnoea. He says he found it difficult to stick with the six-week programme of exercises but the suggestion to sleep with a strip of tape on his mouth helped him control his sleep apnoea. However, breathing through the nose is not the full answer to a complex and potentially serious health issue like sleep apnoea. The exercises do take commitment: forty-five minutes of breathing exercises a day for six weeks will help overcome sleep apnoea, reduce the snoring, and make a noticeable improvement to overall health. Unfortunately most people are unaware that snoring and sleep apnoea may be the result of a faulty breathing pattern and that learning a breathing technique like Buteyko can help resolve the problem. Hopefully articles like this will encourage some to try this natural drug-free alternative to CPAP machines, mandibular splints and surgery. The solution is right under your nose. Phone us at the Buteyko Breathing Clinic, Auckland on 09-360 6291 if you would like to book a private consultation or course with Glenn or to learn more about the programme.